The forthcoming Samsung tablet will have a "Clover Trail" Intel Atom chip, Venture Beat reported Saturday. Intel's Clover Trail line of Atom chips were introduced last fall. At the time, Intel said the processor line was targeted at low-powered Windows 8 devices that combined the functions of a tablet and laptop. However, the Samsung tablet using the Intel chip will be running Google's mobile operating system Android, according to Venture Beat. Last week two benchmarking sites, GFXBEnch and SamMobile, posted test results for a Samsung tablet with a Clover Trail chip running Android 4.2.2. designated the Santos 103 and with the product number GT-P5200. 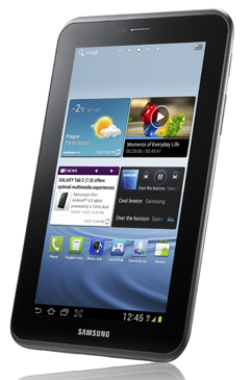 The Samsung Galaxy Tab 2 was dubbed the GT-P5100 before its release. According to the test sites, the new tablet will have a 1280-by-800-pixel display and a processor that runs in the 800MHz to 1.6GHz clock range, which is within the specs of the Atom Z2520 processor. Intel, though, may not be the exclusive choice in the new tablet line. Earlier this year, the International Business Times described a Tab 3 running with Samsung's Exynos 5 dual-core processor with clock speeds up to 1.7 GHz. If Intel's low-powered chip makes it into the Samsung slate, it won't be the first device embracing the technology. Asustek released a seven-inch tablet in February that used a single-core Atom Z2420 processor. Priced at $249, the Asustek model has a 1280 by 800 display and multiple cameras. If Intel has landed a fat deal with Samsung, it should buoy spirits at the company, which is in the middle of a major reorganization under new CEO Brian Krzanich and was caught flat-footed by the emergence of low-powered mobile devices based on ARM architecture as a dominant platform . "Intel is challenged in the mobile space because that space has already adapted to ARM low-powered systems," IHS iSuppli senior analyst Craig Stice told PCWorld/TechHive. Intel faces a two-front war with ARM, according to Cody Acree, director of research at Williams Financial. "You've got two incursions around ARM," he told PCWorld/TechHive. "You've got what's going on in tablets and smartphones, where ARM is the dominant supplier, and then you have servers, where Intel is the dominant supplier, but AMD, Marvell, and others are trying to get into that market with servers based on a conglomeration of low-powered ARM processors." Intel's position in the server market is stronger than its current position in the mobile market. That's because organizations interested in servers based on dense clusters of low-powered chips can do so with less hassle with an Atom-based server than an ARM one, since more than 80 percent of them are already running applications based on the x86 architecture in the Intel chip. "With Atom, you don't have to change your existing infrastructure, your code, your software vendors and your middleware vendors," Acree said. "You can just use Intel and continue with your existing architecture."